Exciting news from Disney Cruise Line just keeps on coming! Today we announced a brand-new stage show, “Tangled: The Musical,” premiering onboard the Disney Magic this November. It is the very first time this beloved Disney tale has been adapted for the stage, and what’s more, the production includes brand-new songs by Academy Award-winning composer Alan Menken! “Tangled: The Musical” will immerse you in Rapunzel’s fairytale world through lavish production numbers and spellbinding music. 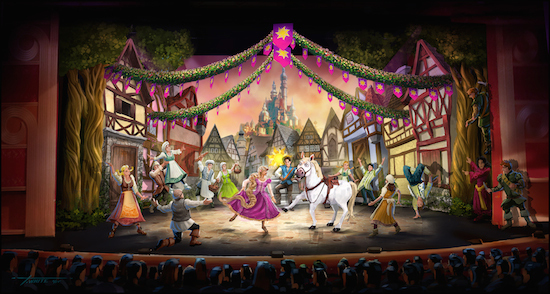 The show will stay true to the storyline from the hit feature film—with a few special twists to create a live staged production—featuring favorite characters like Rapunzel, Flynn Rider, the villainous Mother Gothel and Maximus the police horse. Three new songs created exclusively for this show by Academy Award-winning composer Alan Menken and Grammy Award-winning lyricist Glenn Slater will bring the story to life onstage. Our highly talented entertainment team has been hard at work on this production, and they’ve given us an all-access pass to take you behind the scenes. Over the next several months, I’ll be sharing with you exclusive videos of this stage show coming together. Stay tuned! Those of you on our November 11 four-night Bahamiansailing aboard the Disney Magic will be the first to see this new stage show spectacular! Which of you can I expect to see in the front row? Can we expect a pantomime horse?